Bord na Móna is a fully commercial company like any other trading entity, state-owned or private. This means that we are obliged to make a profit by earning more in revenue from selling our goods and services than we spend to pay our costs. Essentially, selling is the process of winning an order from a customer. 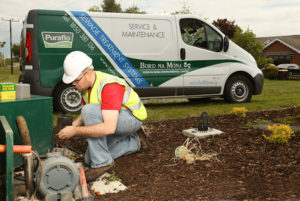 It’s a complicated process across Bord na Móna’s businesses because some of our customers are quite complex (utilities, DIY chains and other general businesses). Selling to these businesses is a sophisticated exercise. Each of the company’s customer-facing businesses, from Fuels, Resource Recovery and Horticulture, to Environmental, Feedstock and Powergen, employs people whose responsibility it is to convince customers to buy our goods and services. In many cases, selling involves winning repeat business, although new users are also the target. The customers for our goods and services range from fuel merchants and hardware shops to garden centres and DIY stores; from households needing a bin collection service, to large companies that have a requirement for waste management; from commercial growers looking for tailor-made growing media, to industrial plants needing solutions for complex air emission problems; from the fuel needed to make electricity, to the electricity itself. The sales personnel who engage these myriad customers include telesales operators, area sales managers, key account managers, technical sales specialists, high-level contract specialists and traditional door-to-door sales people. They can count on administrative, technical and legal backup as required, with the key function of debtor control ever-present. After all, a sale is not a sale until the money has been collected! In the March 2010 edition of Source, we highlighted that marketing is a team effort. To be effective, we must all be customer-aware and continuously seek to know and understand the changing needs of our customers. This will help us to be successful into the future. Sales is more immediate: it is happening right now. However, just as the success of the longer term marketing effort is helped by each employee being customer-aware, it is vital that we all actively support the company’s day-to-day sales activity by ensuring the best products and services and the best customer service, care and attention that we can possibly provide. There’s no quiet time of the year for James O’Dwyer, Sales Area Manager for Horticulture and Fuels. James’s work involves negotiating on a national level with the buyers for the big hardware suppliers and supermarket chains, as well as calling on hardware stores, co-ops, garden centres and fuel merchants for Horticulture and Fuels. “The national accounts include Woodies, Dunnes Stores, Homebase, Amalgamated Hardware and United Hardware, which includes National and Associated Hardware,” says James, who covers the Midlands and the West of Ireland for Horticulture and Kildare, Offaly and Westmeath for Fuels. “These national negotiations involve talking to the buyers, agreeing listings and dealing with issues as they arise. We’re trying to push as much product as possible into all these stores because it’s a very competitive area. That commitment saw James achieve a listing in SuperValu for Horticulture, as well as exclusivity in Dunnes Stores and Musgraves as a new customer. “It’s very competitive, with a lot of competition from Northern Ireland, not just in Horticulture, but also in terms of coal and briquettes,” said James. 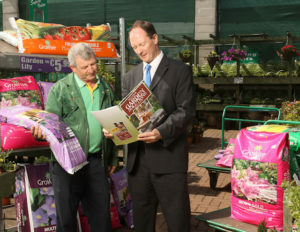 In the meantime, garden centres have been won back for Horticulture, with Growise received well in the marketplace. In Fuels, holding market share is a challenge, as is growing the portfolio with ecoproducts and convenience packs. Water charges and water shortages mean that Claire Walsh is often pushing an open door when she approaches potential customers. A sales agent for Environmental, Claire’s brief covers waste water treatment and rainwater harvesting in the Munster region. “My market is residential houses, small commercial developments, schools, estates and offices,” says Claire, who also deals with enquiries sourced through call centres, engineers, builders and architects. In a challenging environment, Environmental has had to deal with the demise of the construction industry, which was a natural market for its water-related products. “Over the years, we developed important relationships with councils and engineers and they are proving invaluable now,” says Claire. Door-to-door selling is the most direct point of contact that Bord na Móna has with potential customers. “We try to encourage people to switch provider, or to move away from directly using landfill,” says Jonathan Darcy, a door-to-door sales agent for Resource Recovery, who is based in Tullamore and serves the Westmeath market. Consumers are very open to hearing about Bord na Móna’s offerings and are still committed to recycling. “A lot of people are recycling and people are putting out the blue recycling bin more often than the green bin for ordinary waste,” says Jonathan, adding that, this year, sales agents in the field are generating more sales than expected.